It’s that time of the year for footy! Footy tipping and fantasy football competitions have been springing up and there’s a lot to consider. If you’re a fantasy football team manager then you might need some help creating or managing your team. The boys ate Mad Monday are there to help you with player and team reviews. Visit www.madmondayshow.com and see what George and Justin have to say about your team and favorite players. You can also like Mad Monday on Facebook and keep up to date that way. 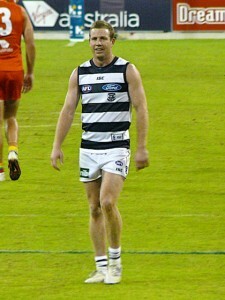 Some of the Cats of 2002 went on to become legends of the Club. Premierships are the benchmark of successful teams. Geelong had been starved of real success since 1963. A founding member of the league as we know it, influential on the rules as we know them, the once powerful Geelong had become mediocre. A spate of losing efforts in Grand Finals dating back to 1967 against Richmond, 1989 against Hawthorn, 1992 and 1994 against West Coast and in 1995 against the Blues, teased us supporters and Geelong had become known as the ‘handbag team’ of the competition. Together with a lack of success on field and financial trouble, Geelong looked to be a real mess. The year 2000 saw Mark Thompson appointed as Senior Coach. His mission was to rekindle and revamp, the team. He saw that a rebuild was in order and over that 2000 season (finished 5th) and the following one in 2001 (finished 12th) blooded some impressive talent, mixed in with some older heads who could show the young guns the way. The plan was laid, the new team unveiled in the reserves. The seniors road was still going to be rocky; because the young guys had to do their time in the reserves and slowly be introduced into the seniors, the old blood trained the new breed ‘on the job’. In 2002 Geelong reserves (VFL team) showed something extraordinary. The young guns, unearthed by Stephen Wells (recruiting manager at the Cats) provided a glimpse as to what the future team would look like, when it conquered Port Melbourne, by 22 points to win the VFL Premiership. In that team there were players who were relatively untried and unknown and they included: Gary Ablett, Steve Johnson, Paul Chapman, Josh Hunt, Jim Bartel, James Kelly… these players have now gone on to become common household AFL names and Premiership superstars. That game also saw the exit of Tim McGrath and David Mensch. A new look team started to take shape. Add to this, impressive list, the likes of Cameron Ling, Cameron Mooney, Corey Enright, Joel Corey, Tom Harley, David Wojcinski and of course Matty Scarlett who debuted with one game in 1999. This was the new breed. In 2012, there was a strange feeling ‘around the Club’; with an ageing list of players, some already retired or moved on from that fantastic list of 1999-2002. We’d got used to winning. We were used to playing finals. Funny isn’t it? Another oxymoron in the football world. Pre-2000 we were used to losing. Used to having a vacant calendar September to do something other than go to finals matches. The 2012 season was a series of ups and downs, but we always felt like we’d make the top eight. Perhaps even defy history and win the big one from outside the top 4 relying just on muscle memory alone. As it turned out, the Cats made an inglorious exit in Elimination week; we were nonetheless proud of our team. From all angles there was talk of the ‘era’ being all but gone. True believers, like me, are not wanting to buy into the assumption of the era being gone. We have new faith. They say that faith is believing in a cause with no real evidence to back it up with. The recent ‘golden era’ has given us evidence, tangible reasons to believe; here’s some evidence: since that VFL premiership day in 2002, the Cats have won 3 AFL premierships, 2 AFL Pre Season premierships, 2 VFL premiership, 2 Brownlow Medals, 3 norm Smith Medals, almost a whole team worth of All-Australians and many other awards, the list too long to mention. In addition, Stephen Wells and the recruiting team have continued their outstanding work by unearthing even more talent which promises to keep stoking the faith fire for a time to come. Can these Cats fill the massive boots being left by the Cats of 2002? It has been less than 24 hours since (at the time of writing) that the siren on the VFL season blasted and in that solitary note possibly heralded a second coming. The Cats again conquered Port Melbourne for the VFL premiership, this time by 33 points. Could this VFL premiership in 2012 signal the same or similar for Geelong as what 2002, in hindsight, was for that team? The list is changing, old breed being exchanged for new. New names, new heroes. Horlin-Smith, Kersten, Brown, Burbury, Stringer, Walker, Sherringham, Gillies, Schroder, Simpkin (to name a few), unfamiliar names to many, lead the changing of the guard. These players have been watching the golden era and have been salivating at the thought of their own success. In the meantime they have honoured the retirements of Simon Hogan and David Wojcinski and at the same time announce themselves as they take a firm grip of the reigns. If success breeds more success, then Geelong is in good shape and can look forward to more sustained successful eras. Add to the mix, Selwood, Hawkins, Duncan, Christensen, West, Guthrie, Motlop, Taylor Hunt, Varcoe, Menzel and Vardy the future looks bright. Will we be looking back at this VFL Premiership team in a few years time as the catalyst of another great Cats era… let’s hope so. Tom Hawkins, much maligned, much anticipated. Some supporters always knew he’d take time to develop; but many were screaming for his head on a platter. It’s time now for the nay-sayers to give him the respect he richly deserves. Finally he is getting the recognition that he has fought for; that he was going to be good is something, internally, the Cats hierarchy knew was within Tom Hawkins. Dumped from the team mid-season in 2011 he fought back and set about resurrecting himself as the prominent forward in the Cats team. He now sits at the (near) top of the season’s goal kicking ladder for the AFL and has cemented himself as the dominating forward for Geelong. Watch this inspiring video on Geelong’s web site to see for yourself just how good this kid is. Just how highly he is respected and how much more we can expect from him in the seasons to come. Jimmy Bartel has nearly done it all. So it begs the question; is he ‘the’ Cats best ever player? Look at his achievements below and see his resume is just about complete. The only thing missing is a Carji Greeves medal for Geelong Cats’ Best and Fairest. Find out what drives him to succeed, it’s all revealed in the two following videos. The way he is tracking this season just might see him winning that elusive best and fairest. Establishing himself as an elite mid-fielder and winning the Brownlow Medal in that position, in recent years he has transformed in to one of the games most versatile and accomplished players. He can play tall, he can ‘run-with’, he can take a great mark and he’s ever so reliable kicking in front of goal. Pound for pound, definitely up there amongst the best. Above all, he’s humble, likeable and approachable. 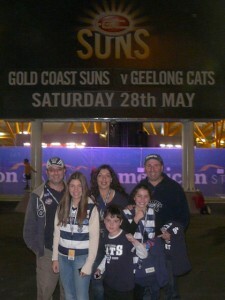 The Cats 2012 season continues on its rocky road with a 10 point win over a determined young Tigers outfit. Led brilliantly by Joel Selwood, Jimmy Bartel and experienced defenders, Tom Lonergan, Harry Taylor and Josh Hunt the Cats were able to hold off a desperate effort by the young Tiger team, who actually drew level midway through the last quarter. Cameo performances were the order of the day in blustery conditions with the wind tunneling down to the old Wade Stand end where a gaping hole prominently figures. Senior players like Tom Hawkins, Paul Chapman and Matthew Stokes showed the way for young guns Allen Christensen, Mitch Duncan, Cam Guthrie and debutant Jessie Stringer who all contributed in their own ways towards the win. The Cats take on the Lions next Saturday night in Brisbane and they better have their playing hats on if they’re going to get over the line. More photos on my Flickr here.